In the end pAsuram, AzhwAr summarizes what was explained in this decad and says “those who learn this decad will attain emperumAn and be uplifted”. Subsequently, AzhwAr explains “this decad will uplift the self” as the result. uyyalAm – shall be uplifted. emperumAn is the lord of all, the creator of brahmA, creator of rudhra, the distinguished lord of the sages, creator of the dhEvas, and is the unique, primary lord for all words; the great benefactor nammAzhwAr who is the leader of AzhwArthirunagari which is having huge wealth, very desirously spoke about such emperumAn in this apt decad having garland of words, among thousand pAsurams; oh those who are addicted to worldly desires, we shall be uplifted with this decad. periya appanai – emperumAn who is with nithya vibhUthi (spiritual realm) and leelA vibhUthi (material realm). piraman appanai – Creator of brahmA, lord of the fourteen layered universe. uruththiran appanai – The lord of such brahmA’s son, rudhra. munivarkku uriya appanai – As sages starting with sanaka et al are fully in brahma bhAvanai (focussed on bhagavAn), uriya indicates emperumAn’s closeness to them. amarar appanai – Creator of dhEvas. ulagukku Or thani appan thannai – What is the need to individually highlight his lordship over everyone? He is the singular lord of the whole cosmos. It is said in SrIvishNu sahasranAmam “bhUthAnAm yO’vyaya:pithA” (the imperishable lord of all creatures). So, why is AzhwAr individually identifying his lordship? As someone who found treasure will say “I found this, I found that” and so on, AzhwAr who had unnecessary doubt in emperumAn‘s intrinsic nature [7th pAsuram] and qualities [4th pAsuram], felt totally lost and having found them again, he is joyfully revealing emperumAn‘s greatness [intrinsic nature] individually. “munivarkkuriya appanai” indicates emperumAn’s subservience towards his devotees [quality]. periya vaN kurugUr – The reason for unnecessarily doubting when emperumAn the protector delays and feeling blissful out of gratitude [when he manifests himself] is due to having been born in this dhivyadhESam. vaN satakOpan – His generosity of composing this as a prabandham [thiruvAimozhi], instead of just enjoying it in his own heart. pENina AyiraththuLLum uriya sol mAlai ivayiyum paththu – The decad where AzhwAr explained how he desired for emperumAn. uriya sol mAlai – These pAsurams are aptly explaining bhagavAn’s qualities unlike vEdham which retracted as in thaiththirIya upanishath “yathO vAchO nivarthanthE” (the speech returned). ivaRRAl uyyalAm thoNdIr nangatkE – For us who were facing away from emperumAn since time immemorial, being engaged in worldly pleasures, and remained as said in thaiththirIya upanishath “asannEva” (he does not exist), there is hope for redemption as said in thaiththirIya upanishath “santhamEnam” (to exist). 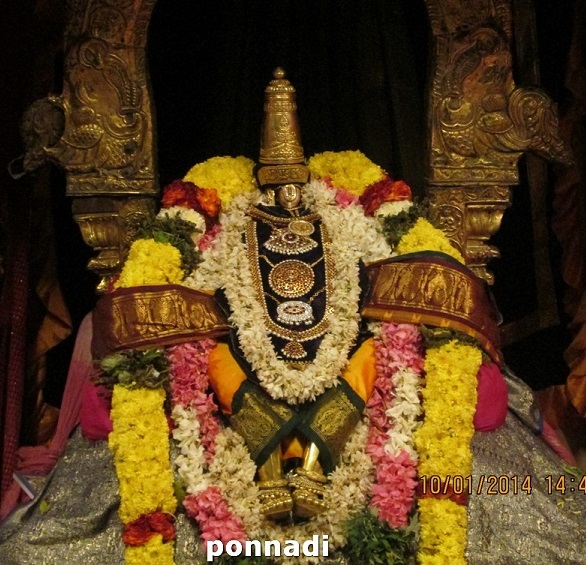 This entry was posted in thiruvAimozhi, thiruvAimozhi 8th centum on February 7, 2019 by Sarathy Thothathri.